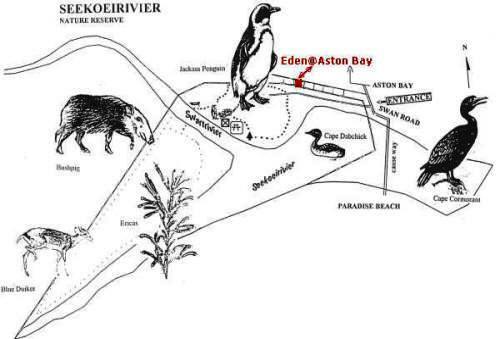 The Seekoei Nature reserve lies between the coastal villages of Aston Bay and Paradise Beach, approximately 5 km from Jeffreys Bay, along the N2. The nature reserve comprises of an area of about 66ha at the confluence of the Seekoei and Swart rivers, where it forms an estuary. The bulk of the reserve is only accessible by way of a small pontoon. Large populations of birds also frequent the estuary. The Seekoei river lies between the winter and summer rainfall areas. The average temperature is 17ºC and the average rainfall 490mm. There is no clear wet or dry season, although most of the rain fall in spring and autumn. The weather can be unpredictable with some warm days and some cold days in summer. The nature reserve is mainly Kaffrarian thicket which consists of the non-succulent subtropical transitional ticket communities. It is a tall closed large leaved (semi-succulent) shrub land with out-layers in rivers and coastal forelands. The most common trees are gwarrie, boerboom, milkwood, sage wood, bitou and aloes. There are also patches of coastal fynbos with Erica, Passerina and Metalasia species. Bushbuck, Grysbok, blue duiker, common duiker, bush pig, porcupine, caracal, yellow and grey mongoose and large spotted genet are some of the species that occur. You are also almost guaranteed to see an ungulated tortoise or two. Fish eagles may be heard calling and flamingos seen if the conditions are right. Thousands of redknobbed coots also nest on the lagoon. 120 Different bird species have so far been identified. A 3 km hiking trail that can be reached by crossing the river on the pontoon. A short 1km hike runs through the northern section of the reserve and passes the bird hide where birds can be viewed from the bank of the estuary. A braaiplace in the form of a lapa is available for organized groups. No fishing, canoes of boats are allowed on the estuary in the nature reserve. No dogs are allowed in the nature reserve. No animals may be disturbed or any plants removed.